Sam Baldwin spent two years working as an English teacher on the JET Programme in the small town of Ono, in Fukui prefecture, Japan. 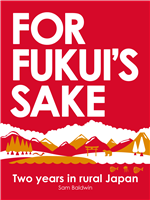 For Fukui’s Sake is a true account of his adventures. He has written about travel for The Guardian, The Times, The Observer, The Independent and The Scotsman, and has contributed to numerous magazines and guide books. He now lives in Edinburgh and works as a writer and editor for an international online travel company. Sam is also the founder of SnowSphere.com, the website for snow travellers, featuring snow stories from China to Chile, Scotland to Spain. View Sam Baldwin’s writing portfolio here. Cover design and illustration by James Ferguson.